Ht / Wt: 5'10" / 194 lb. 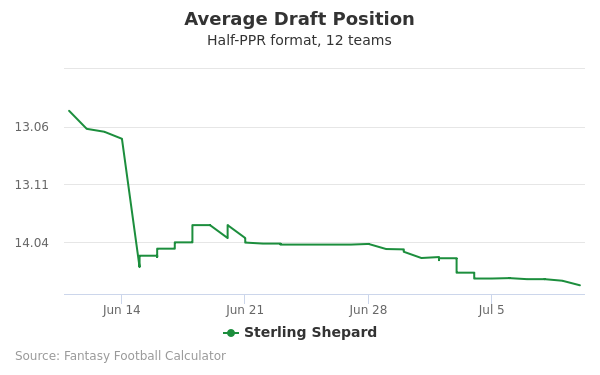 Sterling Shepard's fantasy value is measured by his average draft position (ADP) in fantasy football mock drafts. 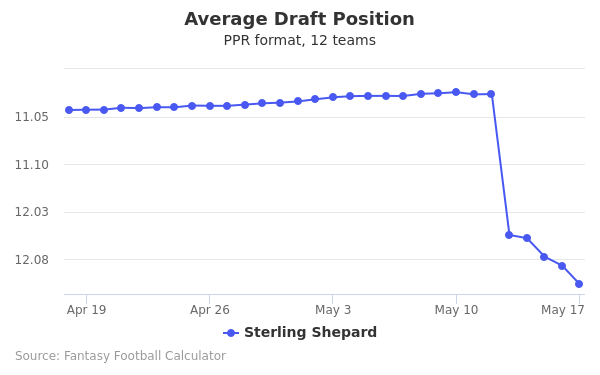 In recent drafts, Shepard's current ADP is 9.08, which indicates that his fantasy outlook is to be the 8th pick of the 9th round, and 104th selection overall. 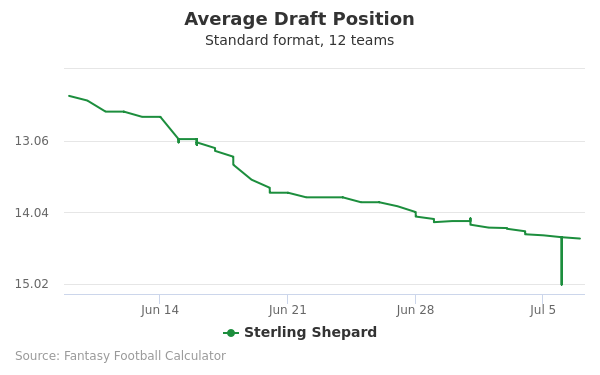 The code below will display a graph that updates every day to show the ADP data for Sterling Shepard for the past 30 days in 12-team PPR leagues. You may use this graph on your website for free with a link back to this page for attribution. Data from fantasy football 12-team PPR scoring average draft position data, based off of the latest fantasy football mock drafts. Draft Jameis Winston or Sterling Shepard? Draft Sterling Shepard or Tom Brady? Draft Golden Tate or Sterling Shepard? Draft Gus Edwards or Sterling Shepard? Draft Matt Breida or Sterling Shepard? Draft Adrian Peterson or Sterling Shepard? Draft Sterling Shepard or Trey Burton? Draft Devin Funchess or Sterling Shepard? Draft Baltimore Defense or Sterling Shepard? Draft Dion Lewis or Sterling Shepard? Draft Jimmy Garoppolo or Sterling Shepard? Draft Donta Foreman or Sterling Shepard? Draft Marquise Goodwin or Sterling Shepard? Draft Kirk Cousins or Sterling Shepard? Draft Ben Roethlisberger or Sterling Shepard? Draft Larry Fitzgerald or Sterling Shepard? Draft LA Chargers Defense or Sterling Shepard? Draft Jacksonville Defense or Sterling Shepard? Draft Delanie Walker or Sterling Shepard? Draft Lamar Jackson or Sterling Shepard? Draft Josh Allen or Sterling Shepard? Draft Geronimo Allison or Sterling Shepard? Draft Greg Zuerlein or Sterling Shepard? Draft Houston Defense or Sterling Shepard? Draft James Washington or Sterling Shepard? Start Jameis Winston or Sterling Shepard? Start Sterling Shepard or Tom Brady? Start Golden Tate or Sterling Shepard? Start Gus Edwards or Sterling Shepard? Start Matt Breida or Sterling Shepard? Start Adrian Peterson or Sterling Shepard? Start Sterling Shepard or Trey Burton? Start Devin Funchess or Sterling Shepard? Start Baltimore Defense or Sterling Shepard? Start Dion Lewis or Sterling Shepard? Start Jimmy Garoppolo or Sterling Shepard? Start Donta Foreman or Sterling Shepard? Start Marquise Goodwin or Sterling Shepard? Start Kirk Cousins or Sterling Shepard? Start Ben Roethlisberger or Sterling Shepard? Start Larry Fitzgerald or Sterling Shepard? Start LA Chargers Defense or Sterling Shepard? Start Jacksonville Defense or Sterling Shepard? 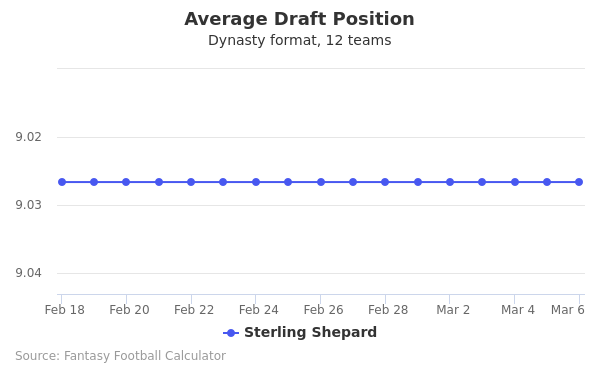 Start Delanie Walker or Sterling Shepard? Start Lamar Jackson or Sterling Shepard? Start Josh Allen or Sterling Shepard? Start Geronimo Allison or Sterling Shepard? Start Greg Zuerlein or Sterling Shepard? Start Houston Defense or Sterling Shepard? Start James Washington or Sterling Shepard? Sterling Shepard just completed his rookie NFL season, and was a starter from the first game. He started along side Odell Beckham, and still managed to get 683 yards receiving and eight touchdowns. Shepard is from Oklahoma and played at the University of Oklahoma. Shepard is the son of former Sooner and NFL player Derrick Shepard. He was born in 1993, and grew up in Oklahoma City. He attended Heritage Hall High School, where he was a standout receiver. Over his high school career he ran for 1,115 yards and had 2,335 yards receiving, and a total of 38 touchdowns. His senior year was by far his best, and he was selected to play in the Under Armour All American Game. He also participated in track and finished second in the state in the long jump. Since his father played at OU it was not very surprising that he chose Oklahoma. As a freshman he played in all 13 games and started four. He had 45 receptions for 621 yards and three touchdowns. He started as a sophomore all but one game, and had 51 receptions for 603 yards and seven touchdowns. He had 911 yards and five scores through seven games as a junior before an injury cut the season short. As a senior had had a highlights filled season with 86 receptions for 1,288 yards and 11 touchdowns. Shepard was taken with the 40th overall pick, in the second round by the New York Giants. In may after the draft he signed a four year contract worth $5.94 Million, which includes $3.24 Million guaranteed salary. At the combine he had a 40 time of 4.48, with a 20-yard split of 2.6. His vertical leap was 41 inches, and his broad jump ws 10 foot, three inches at the combine. Shepard is five-foot, 10-inches tall and weights 194 pounds. He was a USA Today All American his senior season. Shepard got off to a good start in the NFL, named a starter before the first game. He had three receptions for 43 yards and caught his first professional touchdown pass in that game. His most productive game was the second game of the season where ce caught eight passes for 117 yards. Shepard ended the season with 65 receptions for 683 yards and eight touchdowns as he emerged as a promising receiver. Shepard was used mostly on short and intermediate routes, and he proved to be reliable there. His longest reception of the season was 32 yards. He ran the ball three times for 33 yards. After the season he was named to the Pro Football Writers Association All Rookie Team. Shepard is known for his quickness and precise route running, which makes him dangerous over the middle. He had only eight drops in his first NFL season, and was a quality blocker when needed. Shepard's father, Derrick, played at Oklahoma from 1987 to 1991, and went on to play in the NFL. The elder Shepard passed away when Sterling was six. He had two uncles who also played at Oklahoma, Darrell (80-81), and Woodie (75-79). Shepard wears the number 3 in honor of his father, who wore that number when he played at Oklahoma.